Elsewhere on this site is a story about some very important philanthropy – the $500 million McGill has attracted from generous donors since the inception of Campaign McGill. It’s tangible evidence that there’s good to be done in giving. And McGill and its community are clearly the recipients of some very good giving. But now it’s our turn. The annual Centraide campaign has kicked off and once again McGill will make a significant contribution to the community and society around it. And the need this year as great as ever. The effects of the economic downturn, which have touched us all, have been no less devastating to the disadvantaged and destitute. Agencies like food banks, children and youth community programs and family support groups are facing immense needs as the full impact of the economic crisis begins to be felt. Centraide supports 500,000 Montrealers through more than 360 agencies it helps fund. Last year, the McGill community raised a healthy $316,000 toward this cause. This year, we are being asked to dig a little deeper; the goal of the 2009 campaign is $320,000. But here’s a rather astonishing statistic: if every McGill employee donated a twoonie per pay period ($48 a year), we could contribute about half a million dollars to Montreal’s Centraide campaign. Of course many employees give far more than a twoonie every two weeks. And if many more of us did that, the impact would be tremendous. It would go even farther in supporting families who are struggling to cope with the loss of an income, for senior citizens isolated by illness and to help kids at risk of dropping out of society and into a life of crime or street squalor. 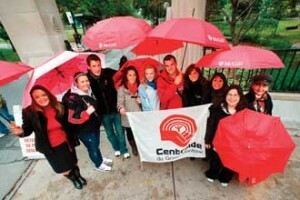 For more information on how to give or to make an online pledge, go to www.mcgill.ca/centraide. Making an online pledge helps cut overhead costs and helps support the University’s sustainability effort through a reduced use of paper.